The François Carillon Domaine, created in 2010, is the long-lasting legacy of a wine family business that dates back to the 16th century in Puligny-Montrachet, a very typical wine village in the south of the Côte de Beaune - Burgundy’s most renown terroir for white wines. 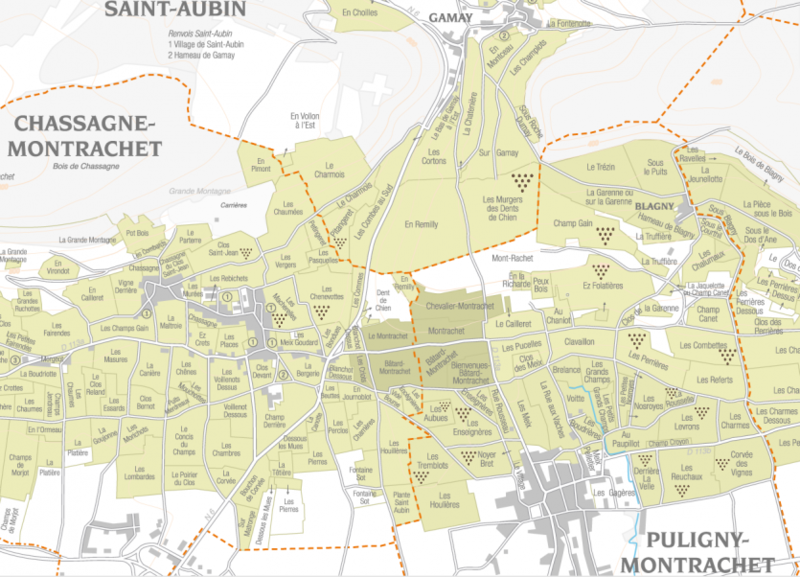 Located in the heart of the village, the estate today owns and manages a sixteen-hectare-vineyard located in Puligny-Montrachet, Chassagne-Montrachet and Saint-Aubin. The estate produces about seventeen (depending on the harvests) different appellations, mainly in Chardonnay. Between passion and precision, the ambition of the François Carillon Domaine is to produce fine, elegant and gourmet wines, representative of the exceptional terroirs from which they come. Referenced in the best restaurants of the world, François Carillon's white wines are also praised by wine experts and lovers, who recognize their exactitude and balance. The Carillon family has been growing grapes in Puligny-Montrachet for almost 500 years. Old written sources found in Puligny narrate the life and work of Jean Carillon as early as 1520. His family continued farming the land and the vineyard until the phylloxera crisis, which occurred in the late nineteenth century. Prosper and Jeanne Carillon then had to leave the region and work near Paris to provide for their needs, but soon returned for the love of the land and farming vines. The entire estate was replanted after the First World War. In the 1960s, polyculture and livestock breeding were abandoned in favor of the almost exclusive culture of Chardonnay by Louis Carillon. François started looking after the family vineyards in 1988 and worked together with his father Louis and brother Jacques until 2010, when the estate was split between the two brothers. Since 2010 and the creation of his own wine estate, François Carillon has become a renown reference in Puligny-Montrachet for the refinement of his wines. Supported by a dynamic and cohesive team of a dozen people, François deploys his energy and enthousiasm to constantly increase his products’ quality and elegance, thus pursuing the development of the family affair with as much ardor as in his early days. He ensures the future of the vineyard by transmitting his know-how and love of his work to his four children. Everything starts in the vineyard. To get the best grapes as possible, François is deeply committed to a precise and environmental-friendly approach of vine-growing. The vines are thus managed as naturally as possible. Since 1992, weeds in all our parcels of vines are removed by plowing by tractor or horse, and no weed-killer is used. As our Head of Culture has been taking care of the same vines for almost 30 years, he has an exact knowledge of each parcels and can conduct specific actions so that the grapes can reflect precisely the terroir they grow on. Respect for the environment and living organisms is something François deeply believes in. Only natural-origin products are used, and only when required. Moreover, instead of burning vine shoots as it is often the case in Burgundy, we process them into small chips, compost and spread them in the vines. Coupled with horse manure, they enrich the soil without using chemical fertilizers. The vineyard density is around 10000 vine sper hectare, enabling them to extract plant food and water from the terroir of Puligny. Pruning of the vine is performed manually (“Guyot” pruning) and yields are strictly controlled via disbudding as well as green harvesting. Grapes are harvested manually every year. The François Carillon Domaine produces 16 different appellations, spread over the villages of Puligny-Montrachet, Chassagne-Montrachet and Saint-Aubin. Among these appellations lie 9 Premiers crus (2 Saint-Aubin, 3 Chassagne-Montrachet and 4 Puligny-Montrachet), 5 villages wines (3 Puligny-Montrachet and 1 Chassagne-Montrachet), and 4 regional wines (2 Bourgogne Chardonnay, 1 Bourgogne Aligoté and 1 Bourgogne Pinot Noir). The estate's cellars are located at the heart of Puligny-Montrachet, in old family dwellings. To get more information on our wines, please check our list of appellations. The grapes are harvested manually, usually at the beginning of September, depending on their ripeness. After a soft pneumatic pressing, the grape musts are clarified before undergoing their alcoholic and malolactic fermentations in oak barrels (between 10 and 15% of new oak). They remain there for about twelve months, during which our wines are matured on on lees, with occasional stirring. The wines are then transferred in stainless steel vats during six months to guarantee freshness and tautness, prior to bottling, which takes place between January and April. A great deal of attention is given to capping our wines. From our village appellations to our best Premiers crus, we use the best cork available to guarantee a impeccable ageing in bottles. For our Bourgogne Chardonnays, we resort to Ardea Seal stoppers, thus guaranteeing a good ageing in bottles as well as no organoleptic defects.